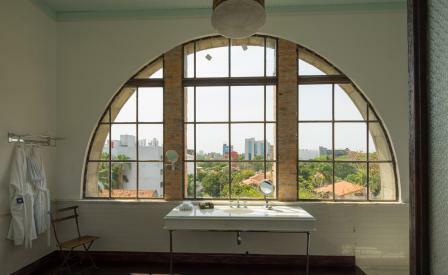 Housed in a new factory-style red brick industrial building in Las Carmelitas, Asunción´s chic residential neighbourhood, La Alondra Factoría has mastered the art of standing out from the crowd. Hoteliers Porfirio Aquino & Valería Rolón have worked together with a dream team of historians, museologists, architects, interior designers and creative directors to recreate a hotel that digs into Paraguay’s mid 1800´s splendour, which came to a sudden end when the 16-year war against Argentina, Brazil and Uruguay began in 1854. ‘Paraguay was the most advanced country in South America, but the brutal war left the country with no industry and almost no male population. Had it not happened, this type of building we created with European influences would be typical in this city,’ explains Aquino. A dramatic atmosphere reincarnating past glories sets the tone of the hotel, which includes a library, bistro, private guest lounge and diner, gym and patio with a swimming pool. Like a private cosy home, each of the 17 guest rooms feature a mix of recycled eucalyptus and pine woods, antique leather and velvet Louis XV, Empire and Chesterfield chairs and plush details such as marble table tops and leather-rimmed mirrors. The library at the entrance, boasts a large handcrafted chandelier, dark parquetry and Persian rugs, while the restaurant - much welcomed in the area - provides a dearth of culinary offerings fixed with local ingredients. A must try: flan de dulce de leche and mandioca chips.